Definition at line 110 of file ServiceGroups.h. Definition at line 228 of file ServiceGroups.cc. References Adaptation::ServiceGroup::finalize(), Adaptation::DynamicGroupCfg::id, Adaptation::ServiceGroup::kind, Adaptation::ServiceFilter::method, Adaptation::ServiceGroup::method, Adaptation::ServiceFilter::point, Adaptation::ServiceGroup::point, Adaptation::DynamicGroupCfg::services, and Adaptation::ServiceGroup::services. Definition at line 106 of file ServiceGroups.h. References Adaptation::ServiceGroup::allServicesSame, String::append(), Adaptation::ServiceGroup::at(), Adaptation::ServiceGroup::checkUniqueness(), String::cut(), DBG_CRITICAL, DBG_IMPORTANT, debugs, Adaptation::ServiceGroup::finalizeMsg(), Adaptation::ServiceGroup::has(), HERE(), Adaptation::ServiceGroup::kind, Adaptation::ServiceGroup::method, Adaptation::methodNone, NULL, Adaptation::ServiceGroup::point, Adaptation::ServiceGroup::removedServices, Adaptation::ServiceGroup::services, and String::size(). References Adaptation::ServiceGroup::at(), Adaptation::ServiceGroup::checkUniqueness(), error(), Adaptation::ServiceGroup::finalizeMsg(), Adaptation::ServiceGroup::findLink(), Adaptation::ServiceGroup::findReplacement(), Adaptation::ServiceGroup::findService(), and Adaptation::ServiceGroup::services. 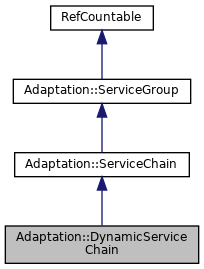 Referenced by Adaptation::ServiceChain::advance(), Adaptation::ServiceGroup::checkUniqueness(), Adaptation::ServiceGroup::finalize(), Adaptation::ServiceGroup::findService(), and Adaptation::ServiceSet::replace(). References i, ConfigParser::NextToken(), NULL, ConfigParser::ParseWordList(), Adaptation::ServiceGroup::services, and wordlistDestroy(). Definition at line 105 of file ServiceGroups.h. Definition at line 243 of file ServiceGroups.cc. References Adaptation::DynamicGroupCfg::add(), Adaptation::FindService(), Adaptation::ServiceGroup::id, String::limitInit(), Adaptation::ServiceFilter::method, NULL, Adaptation::ServiceFilter::point, and strListGetItem(). Referenced by Adaptation::ServiceGroup::finalize(), Adaptation::ServiceGroup::findLink(), Adaptation::ServiceGroup::findReplacement(), and Adaptation::ServiceGroup::findService(). Referenced by DynamicServiceChain(), Adaptation::ServiceGroup::finalize(), and Adaptation::ServiceGroup::finalizeMsg(). Referenced by DynamicServiceChain(), Adaptation::ServiceGroup::finalize(), and Adaptation::ServiceGroup::findService(). 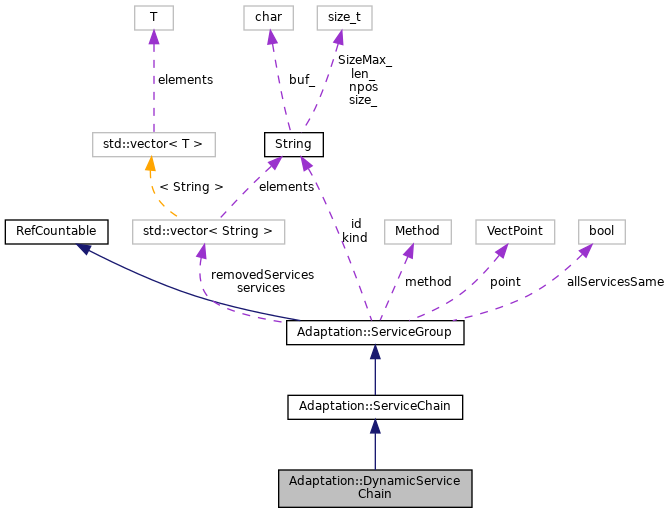 Referenced by Adaptation::ServiceGroup::at(), DynamicServiceChain(), Adaptation::ServiceGroup::finalize(), Adaptation::ServiceGroup::has(), Adaptation::ServiceGroup::parse(), and Adaptation::SingleService::SingleService().